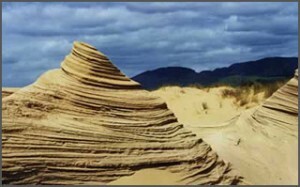 Rangi Point on the northern part of the Hokianga Harbour mouth there are spectacular sand dunes. Access can be gained from the South side by boat across the Hokianga Harbour with the Hokianga Express leaving from the wharf in Opononi, and also on land from Mitimiti (15 km drive along beach). 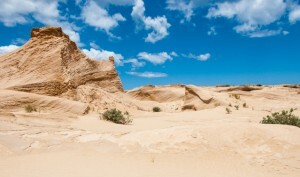 Spiritually significant to local Maori, the North Head Dunes are natural wonder. The area contains an array of interesting features, from sacred areas that visitors are asked to respect, to huge sand sculptures and massive sand canyons. A gallery of natural erosion, a world of shifting sands, wind scarred bluffs and delicate temporary overhangs. 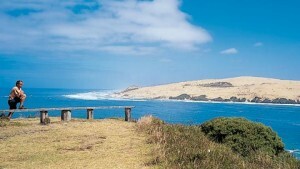 From the summit of the dunes is a limitless vision of the coast line and the Tasman Sea. It is in its own unique way it is also one of New Zealand’s most spectacular and memorable landscapes. In the back towards the Tasman Sea are deep canyons. Just do not stand right on the edge, they can breake off and you will never be seen again!